In order to continue to live, microbes and germs have found ways to prevent drugs from killing them in the process of curing patients—when the patients ingest the drugs for treatment. Microbes destroying drugs within patients and preventing the drugs from working is called drug resistance or antibiotic resistance. The consequence of that phenomenon is always death of the patient. Fig. 1. How fast new cases of antibiotic resistance have been arising around the world. Very fast rise in the number of cases of antibiotic resistance each year around the world. 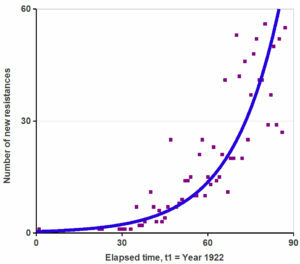 The trend (as shown by the line) is exponential. 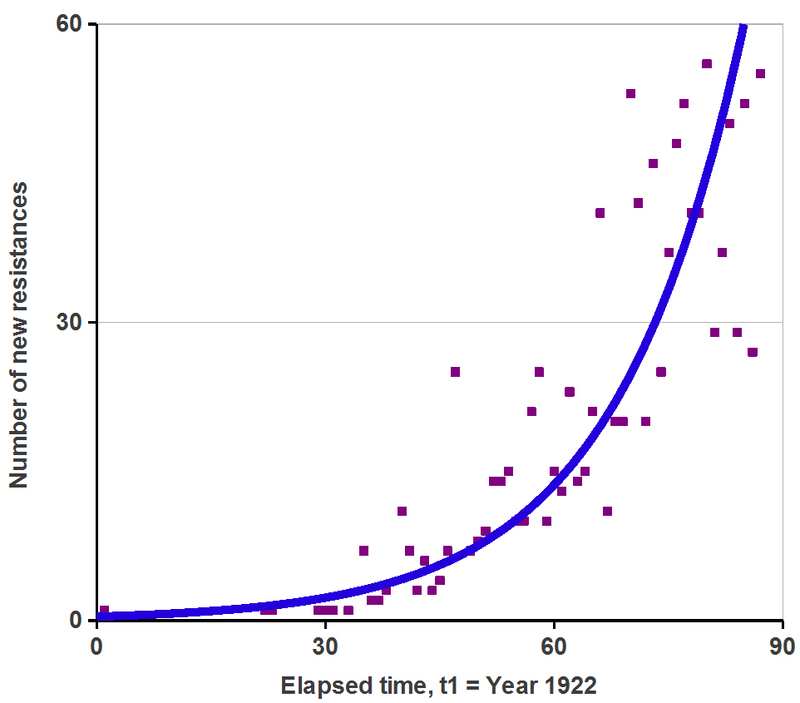 First data year is 1922, which corresponds to elapsed time t = 1. So, it is a dangerous phenomenon and the speed of its occurrence has been increasing very fast since the first recorded case in 1921. Along with the increase in its occurrence is the similar increase in the number of people dying every year. In fact, it is now forecast that about 10 million people will be dying every year worldwide by the year 2050 as a consequence of antibiotic resistance. That’s the same as the death rate during World War II. The bad part is that it is getting worse and worse. So, the number of people killed ten years later, in 2060, will be even greater than 10 million people. And this growing trend goes on year after year, for ever. The economic impact is equally devastating as much of the workforce will be gutted across the globe, with as much as 100 trillion USD lost by 2050. So, clearly, it is a very dangerous phenomenon. Yet, we have so far not been able to calculate exactly how rapidly this problem has been growing in terms of the number of cases of resistance that there is out there. We just know that it is growing, but how fast? —Up to this point, we had no way of knowing, much less make predictions into the future as to how many cases of resistance will arise. This research presents clear and simple mathematical formulas which allow us to calculate how fast the number of resistance cases has been growing. The formulas are designed to allow forecasts of the number of cases of resistance there will be in the future based on how many drugs the pharmaceutical industry has manufactured and sold to people through the market. Modeling and predicting drug resistance rate and strength.